When you lock the vehicle, the central locking system will lock the doors and the boot lid. When you unlock the vehicle, the central locking system will unlock either the driver's door only, or all the locks on the vehicle, depending on the setting you have selected on the sound system or MMI*. 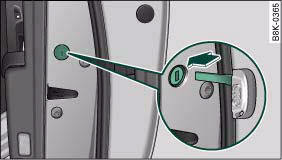 The Auto Lock function locks the doors and the boot lid when the vehicle exceeds a speed of about 15 km/h. The vehicle is unlocked again when the ignition key is removed. Alternatively, the vehicle can also be unlocked via the central locking switch or by pulling one of the inside door handles. The Auto Lock function can be switched on and off on the sound system or MMI*. In the event of an accident in which the airbags inflate, the doors will be automatically unlocked to facilitate access and assistance. The central locking system is combined with a deadlock mechanism. Once the vehicle has been locked from the outside, the door handles on the inside are deactivated. This makes it more difficult to break into the vehicle. If the anti-theft alarm system senses interference with the vehicle it triggers an audible and visible alarm. The anti-theft alarm system switches on automatically when the vehicle is locked. It switches off automatically if you unlock the vehicle using the remote control. If you unlock the vehicle by inserting the key in the driver's door, the ignition must be switched on within 15 seconds, otherwise the alarm will be triggered. On some export versions, the alarm is triggered immediately when you open a door. 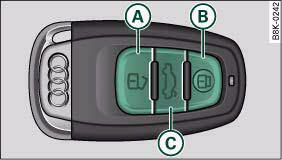 To deactivate the alarm, press the unlock button on the remote control key or switch on the ignition. The alarm will also switch itself off when it comes to the end of its cycle. Switch off the interior monitor and tow-away protection if you wish to prevent the alarm from being triggered accidentally. 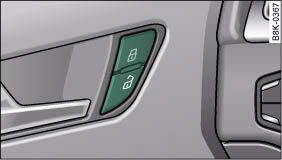 The turn signals will flash twice when the vehicle is unlocked and once when the vehicle is locked. If the turn signals do not flash, one of the doors, the bonnet or the boot lid is still open. 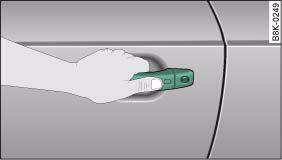 • When the driver's door is open, it cannot be locked together with the other doors by pressing the central locking switch and then closing the door ⇒ page 49. • On vehicles with advanced key*, the boot lid will be released again automatically if the remote control key that was last in use is left inside the boot when the boot lid is closed. To prevent yourself from being locked out, do not lock the vehicle with the remote control key before closing the doors or boot lid. 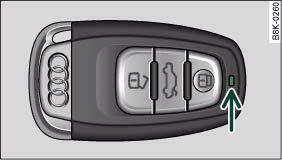 If you accidentally press the locking button on your remote control key when any of the doors (except for the driver's door) are open, then put the key down inside the car and forget to take it with you when you close the doors, you can still open the doors for about one minute before the vehicle is locked. Do not leave anyone (especially children) in the car if it is locked from the outside and the deadlock mechanism is activated: the doors and windows cannot then be opened from the inside. Locked doors could delay assistance in an emergency, potentially putting lives at risk. • Never leave any valuable items in the vehicle unattended. Even a locked vehicle is not a safe. • If the diode on the driver's window sill lights up for about 30 seconds when the vehicle is locked, the central locking system or anti-theft alarm* is not working properly. Please have the malfunction repaired by an Audi dealer or qualified workshop. • The interior monitor of the anti-theft alarm* system will only function as intended if the windows and the tilting panorama roof* are closed. The remote control key will lock and unlock the car and start the engine. 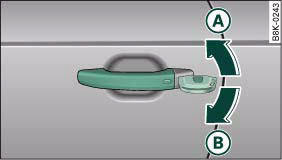 The spare key is intended for temporary use only and should be used only in an emergency. Keep it in a safe place and do not carry it on the keyring. 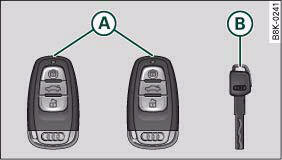 If you should lose a key, please contact an Audi dealer. Have the remote control coding for that key deactivated. For this purpose you should bring all available keys with you. It is also important to notify your insurance company if a key has been lost. The immobiliser is designed to prevent unauthorised persons from driving the vehicle. If an uncoded key is used, SAFE will appear in the mileage recorder display. It may not be possible to start the engine with the key if there is another ignition key from a different make of vehicle on the same key ring. Data related to the service and maintenance of the vehicle are stored continuously on your remote control key. Your Audi dealer can read out the data and will then be able to tell you what service work is required. This also applies to vehicles with advanced key. The stored settings are then recalled automatically the next time the vehicle is unlocked, the doors are opened or the ignition is switched on. • Always take the key with you when leaving the vehicle - even if you only intend to be gone for a short time. This is especially important if children are left in the car. They might otherwise be able to start the engine or use power-operated equipment such as the electric windows - this could lead to injuries. • Wait for the vehicle to come to a standstill before removing the ignition key from the lock. Otherwise the steering lock could engage suddenly, causing an accident. The function of the remote control key may be impaired by interference from other nearby radio signals (for example from a mobile telephone or TV transmitter) if these are in the same frequency range. The indicator lamp on the remote control key lights up when you press the buttons. The indicator lamp should light up once briefly when you press one of the buttons briefly. The indicator lamp should flash when you press and hold one of the buttons (convenience open/close). – Press the release button A ⇒ fig. 32. – Pull the emergency key B out of the remote control key. – Press the release catch A ⇒ fig. 33 on the battery carrier and at the same time pull the battery carrier out of the remote control key in the direction of the arrow. – Insert the new CR 2032 battery with the “+” symbol facing downwards. – Slide the battery carrier carefully into the remote control key. – Insert the emergency key. Used batteries must be disposed of appropriately and must not be discarded with ordinary household waste. The new battery must be of the same type as the original one (CR 2032). – Press the release button A ⇒ fig. 34. • activate and deactivate* the front passenger's airbag. • lock and unlock* the glove box. • lock and unlock the lockable rear seat. • manually lock and unlock the vehicle if this is not possible using the remote control key. In the event of a malfunction in the vehicle's electrical system, it may no longer be possible to remove the ignition key. – Press the release catch A ⇒ fig. 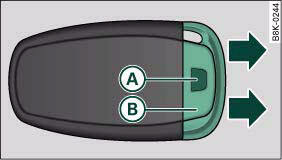 35 using a ball-point pen or a similar object and pull the emergency key B out of the remote control key. – Use the emergency key to lock the vehicle. – Have the vehicle's electrical system checked by a qualified workshop. – Take the adapter for the spare key out of the glove box ⇒ fig. 36. – Slide the spare key ⇒ fig. 37 all the way into the adapter. Make sure that the Audi rings are facing upwards. – Press the spare key in the adapter downwards until you hear it engage. – Insert the adapter, spare key first, into the ignition lock. You should now be able to start the engine in the usual way. – Press the button to unlock the vehicle ⇒ fig. 38. – Press the button to lock the vehicle ⇒ . The system will either unlock all the doors or certain doors only, depending on the settings you have chosen on the sound system or MMI*. 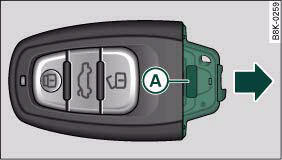 On vehicles with the advanced key* the selector lever must be in P, otherwise it will not be possible to lock the vehicle. 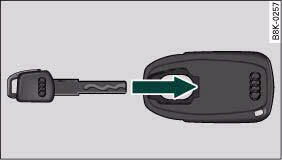 – Touch the sensor on the door handle once to lock the vehicle ⇒ . The system will either unlock all the doors or one door only, depending on the settings you have chosen on the sound system or MMI*. • To save electrical power, the proximity sensors are switched off after a few days. 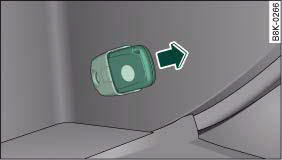 You will then need to pull the door handle once to unlock the vehicle, and a second time to open it. – Turn the key to position A ⇒ fig. 40 to unlock the vehicle. – Move the selector lever to position P (automatic gearbox). – Turn the key once to position B ⇒ to lock the vehicle. In order to switch off the anti-theft alarm*, you must switch on the ignition within 15 seconds after opening the driver's door. Otherwise the alarm will be triggered. If the central locking system should fail to work at any time, the passenger's door can be locked manually. – Press the button to unlock the vehicle ⇒ fig. 41. • The doors and the boot lid cannot be opened from the outside (for safety reasons, when stopped at traffic lights, etc.). The doors and the boot lid are locked automatically when the vehicle reaches a speed of about 15 km/h (Auto Lock). You can unlock the vehicle again via the central locking switch. 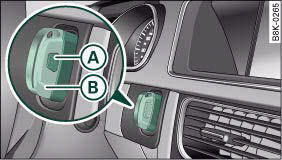 You can use the sound system or MMI* to select which doors are unlocked by the central locking system. – Select: Function selector button CAR > Central locking > Unlocking single door. In the Unlocking single door menu you can specify which doors you wish to have unlocked when you unlock the vehicle using the remote control key or the advanced key*. If you switch the Unlocking single door function on, only the driver's door will be unlocked when you press the unlocking button on the remote control key once. You can still unlock all doors and the luggage compartment. To do so, press the unlock button twice on the remote control key. When you lock the vehicle, the central locking system will automatically lock all the doors and the boot lid together. If you select “Locking boot lid/tailgate” on, you can no longer open the luggage compartment using the handle on the boot lid, fig. 46. 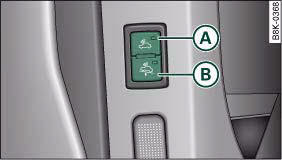 In this case, you can open the boot lid using the button on the remote control key, fig. 38 or the unlock switch on the driver's door, fig. 45. If you select “Retract mirrors” on, the exterior mirrors will be retracted automatically ⇒ page 70 when you press the lock button on the remote control key. When the vehicle is locked, the alarm will be triggered if movements are detected in the interior (e.g. by animals) or if the vehicle's inclination is changed (e.g. during transport). You can prevent the alarm from being triggered accidentally by switching off the interior monitor and/or tow-away protection. – Press switch A, fig. 43. The diode in the switch will light up. – Press switch B. The diode in the switch will light up. The interior monitor and tow-away protection will be switched on again automatically the next time the vehicle is locked. If the central locking system should fail to work at any time, each door will have to be locked separately. A mechanical locking device (only visible when the doors are open) is provided on the front passenger's door and the rear doors. – Take the emergency key out of the remote control key. – Pull the cap out of the opening ⇒ fig. 44. – Insert the key in the slot inside and turn it as far as the stop to the right (if the door is on the right side) or to the left (if the door is on the left side). Once the door has been closed it can no longer be opened from the outside. The door can be opened from the inside by pulling the door handle. If the child-proof catch is engaged on one of the rear doors, the door can be opened by pulling the inside door handle once and then opening the door from the outside.